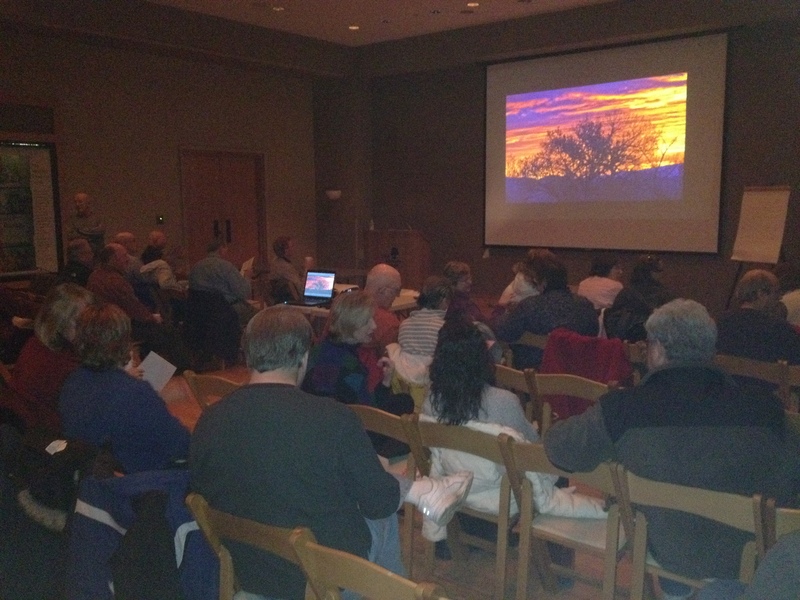 February 13, 2012, Hank Erdmann presented on the “Time and Timelessness in Photography.” He discussed different aspects of time and timelessness. He credits most of his inspiration to David Ward (“the Elliot Porter of the UK”), photographer and writer. “Photography has this sense of history and a documentary nature regardless of the past or current ability to manipulate it.” As photographers we record what we see through photographs but should we ask ourselves why we took that particular shot at that particular time? Taking the shot is not just about shooting what we see in front of us but thinking about what we see, the conditions of when we see it, and/or anticipating the best conditions to shoot. It is about having the benefit of experience and patience to wait for just the right time. Photographs have a sense of timelessness when they are shot without manipulation. It is the classical landscape painting that helps visualize and stimulate us in order to create a timeless photograph. We can think about time considerations in our composition—how are we going to use our thought process to create our art. What does it take? Although we use our five senses before creating the image—enveloping ourselves within the moment, we find that the sensory input is lost the moment we shoot the image. Yet, in the classic photo where it brings a sense of depth or dimension to the image, we can still take it further by converting it to black and white. This was an excellent presentation, informed through Hank’s personal history, his photographic work, his appreciation for art, and his expertise in craft. Hank’s presentation was well attended—at least 57 members present. Thank you for inspiring us all Hank! Download and print his notes for more information. Hank Erdmann is a professional natural history photographer who resides in Will County, Illinois. He has photographed throughout North America, making the Midwest his primary geographic area of interest. A love of history, especially the maritime history of the Great Lakes, kindles a special interest in the ports, shorelines, islands and natural areas of Lakes Michigan and Superior and their surrounding environs. Hank is the owner of Lake Effect Photographic Adventures, a member artist at Gallery 7, a photographic educator for the Clearing Folk School and an instructor for the Morton Arboretum Nature Photography Education Program and many other entities. Visit Hank’s website www.hankphoto.com for information on his photo tours, workshops and image galleries.